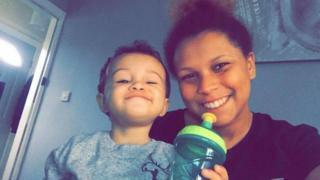 A teenager arrested after a mother and her young son were found dead at home has been released under investigation. Kia Russell, 19, and two-year-old Kamari died at their home in Swinburne Road, Ipswich, on 6 March. The boy, 17, had been bailed to 29 March but has now been released while inquiries continue. He was not arrested on suspicion of murder or manslaughter. Ms Russell's death is not being treated as suspicious but her son's is being treated as murder. Both died as a result of compression to the neck, post-mortem examinations found. Neighbours described "lovely" Ms Russell as a "brilliant mum" following news of her death, and flowers and toys were left outside her house. The following week friends and family gathered in Ipswich to mark what would have been Kamari's third birthday. A provisional date for their inquests has been set for 9 September.